The Supreme Court today issued notice to the Italian Ambassador and restrained him from leaving the country without its permission, taking exception to Italian government's refusal to send back marines charged with the killing of two fishermen. The bench, also comprising justices AR Dave and Vikramajit Sen, passed the order after it was brought to its notice that the Republic of Italy has reneged on its assurance given to the apex court. The bench further said that if notice is not served to the marines, who are right now in Italy, then it will be served through the Italian Ambassador. The bench posted the matter for further hearing on coming Monday after the AG pleaded for an urgent hearing on this issue. The two marines were on board Italian vessel 'Enrica Lexie', when they shot dead two fishermen off the Kerala coast on 15 February, last year. The two accused marines were allowed by the apex court on 22 February to travel to Italy for four weeks under the control and custody of the Italian Ambassador, to cast their ballot in the elections scheduled there for 24 -25 February. The court had said that the marines are only allowed to travel to Italy and remain there and will have to return to India. 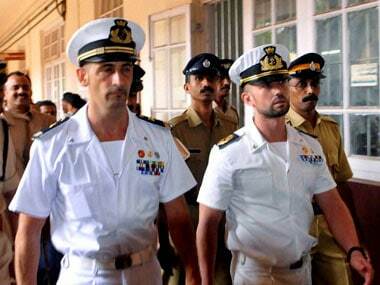 The Italian government, which had given an undertaking before the apex court that the marines will be sent back, had on 11 March sent a 'Note Verbale' to the Indian government informing it that the two will not be sent back. Earlier, on 18 January, the apex court had turned down the Italian government's plea that the Indian courts had no jurisdiction in the case and had held that the two marines should be tried by the Centre by constituting a special court to conduct their trial.